One of the subsections in my collection are dark decks and what could be more dark than a satanic deck (from a conventional view - no offence meant to satanists) and this New-Zealand one has been on my wishlist for quite a while. 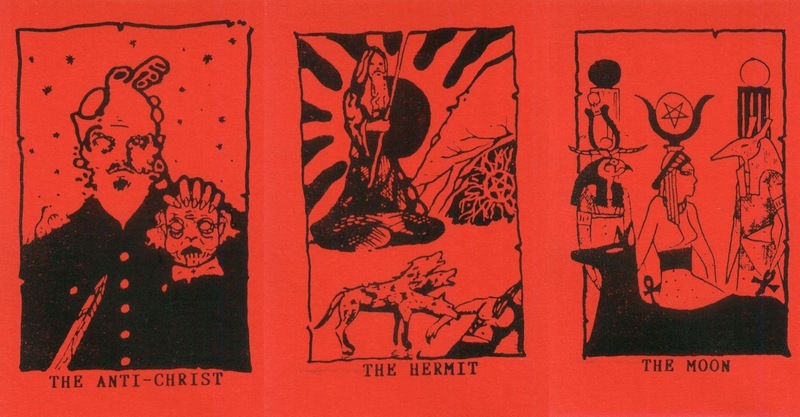 Low-budget printed with black ink on red paper it's the adaptation from the satanist point of view, like the renaming of the Emperor into The Anti-Christ but largely following the normal tarot structures. The deck, that is a majors only, resulted and reflects the path-working of Faustus Scorpius, and given form by Finnish artist Juha Vuorma and is accompanied by a 20 page booklet with information about the cards and for each a description of the 'astral journeys' from where the images came from and also a satanic spread . These make me feel a little uncomfortable, yet I'm strangely drawn to them!